« Is the Urban Broadband Fund a dark fibre bribe? you link two completely different issues as the same problem. Are you Roald Dahl? Ireland can’t say they weren’t warned. Patching up the old phone network is no way to spend public money, and despite all the ‘superfast’ hype it is a scandal about to be replicated all through the uk as councils fall over every day and get suckered into it. It is not fibre broadband unless its fibre to the home, and its far better to invest in that than a silly train for a few commuters who want to save 20 minutes on a journey. It is far better to do the job once, and do it right rather than playing catch up for another decade. The copper has to go, service has to be consistent and reliable, so if BT can’t do it then the funding should go to those who can go the extra mile and get everyone online with fibre, real fibre not ‘fibre based’. The Altnets lead innovation in the USA and should be given a chance in the UK. The incumbent is wrapped up in protecting its obsolete assets. Time for a change. Which county will be the first to prove it has moral fibre and stand up to the bloated Goliath? As you keep repeating the manta I will remind that many of the countries with massive fibre deployment in the cities are actually not FTTH, but FTTB. You may feel it is a nuanced difference, but it is important in the world of fibre deployment. Altnets are leading innovation in the UK surely, or are you actually saying B4rn is not innovative and leading the way? Usual meaningless sound bites from Chris! HS2 is needed for capacity, so more complex than just quoting a 20min time saving. Fibre into every UK property would be ideal but we won’t see it soon. Is there a ‘altnet’ that could fund (ie borrow for) a deployment across a county and see a return where only a percentage of users would change over as their current speed is adequate for their current needs? Particularly in towns and villages where there are pavements to dig. How are the altnets funded in the US? Chattanooga was quoted by some as a brilliant model to follow and then we find it’s set up by the power company. i dislike the term “altnet” as it implies they are somehow a lesser alternative to the incumbent supplier . “altnets” are either commercial companies that provide Broadband or community groups in their own right. not some 2nd rate”alternative” to openreach. Hanpshire county councils recent open market review recognises other providers but still refers to them as “alternative”. A well researched article Ian – many thanks. @somerset Nothing to say about the obvious network fault the chaps reported to BT? It is shortsighted to pretend that copper bearer rural broadband has a future. It is also subjective to suggest that investment of public funds into BT copper infrastructure on the scale seen in Northern Ireland, is justified. A chunk of chocolate today, will ensure we will not enjoy a bar of the stuff tomorrow. The right approach is to *meaningfully* start the FTTP journey. Investment in VDSL2 is a regret spend – the infrastructure will be junked. It cannot be reused when it is inevitably replaced. Show me a sensible price list for FTTP from BT, with a map of where it is available, today. It is simply not available and affordable (you need both) today. 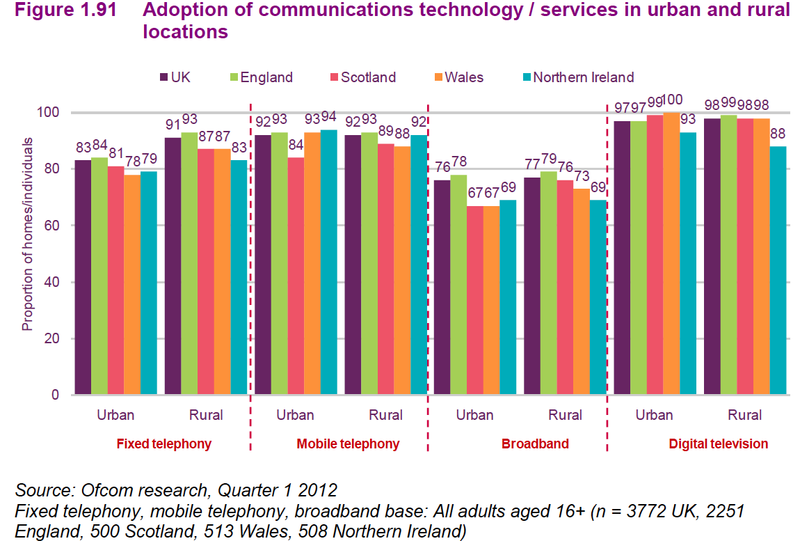 Milton Keynes is the biggest rollout I am aware of, with BT doing a “pilot” of 1000 premises across the UK. Not impressive numbers, clearly indicating where their preference lies. One more time, “BT Infinity is NOT fibre optic broadband – it is COPPER”. Geez that winds me up. Cornwall 10,000 properties passed with FTTP, and 1,000 are live. BT Retail also sell this as BT Infinity, so if criticising the retail product one needs to be clear on where the criticism is placed. The FTTP rollout from Openreach in the pure FTTP areas is slow, but they are going for the easy low hanging fruit first, and given the moans about when will my cabinet be done, this is possibly the right way around. FTTP is 7 hours per property roughly, i.e. going from manifold to actually having modem active inside home. Openreach being slow at FTTP is presenting their competitors a perfect opportunity to get people signed up to their infrastructure, instead we have lots of metro rings being built with the promise of FTTH, but once all the council buildings are connected we hear no more. Andrew On the metro rings not delivering FTTH, is that because of the apparent prohibition on carrying private traffic on a public sector network? I though Hampshire had found a way around that, and I’m aware of at least one community wireless operator who is using a public sector network for backhaul. If the public was allowed to tap into for example, the various fibre schools neworks, what a difference that might make to FTTP take-up. So who prohibits carrying private traffic on a public network? Good story, but could it actually be because of the complexity in setting it up and managing it 24×7? Dealing with billing, security, traffic management etc. is not trivial. Maybe you could expand on the words ‘tap into’ a school fibre network. With so many equipment suppliers offering to look after users on a managed services basis, I doubt that it’s as hard as you try to make out. If it’s OK for Ericsson to look after tens of millions of mobile customers, I’m sure one could have an interesting chat with them to do it for a fixed network. So who prohibits carrying private traffic on a public network? Thanks Andrew – to clarify my criticism of “BT Retail” Infinity, it is targeted at the overwhelming majority of subscribers which are VDSL based. BT Retail releases no official numbers, so we must guess. The national TV advertising tells us all that it is “fibre”. It is not. If I have one gold coin, and 99 tin coins painted yellow, can I sell you 100 gold coins? No I cannot. It frustrates me that the Advertising Standards Authority backs BT Retail’s advertising, saying that the “majority” of the cable is fibre, therefore it is fair to call it a fibre service. Missing the point entirely, as it’s the customer service that matters, not the bearer. Fibre gives the impression that the benefits of fibre will be delivered when clearly they will not. It is not a “fibre” quality service. It is a copper service, predominantly. Or is it just the boring answer that councils would not consider it ‘core business’ and could not justify the costs of the network upgrades and management required when there are other solutions available. ‘Tapping into’ is the words of a non engineer! Never pretended to be an engineer. Many things, but not that. Does that make me a bad person, to be not an engineer? Perhaps Ian Livingston should resign too, since he’s an accountant. But you use ‘tapping into’ a term without explaining what you mean. ps. I don’t remember you explaining how ALA was going to save the government some money. Tapping into as in used for backhaul cf CLEO and the local villages. ALA shouldn’t cost of save the government anything, but it could save operators a bundle. Please explain how ALA saves money and how telcos interconnect now. No. Not because I can’t, but because you are being vexatious. You are also distracting from a far more important issue, which is that millions of pounds of taxpayers money may be spent extremely unwisely because BT has found itself, deliberately or by accident, as the effectively the sole likely bidder for BDUK money. Unless that changes, ALA and telco interconnect are irrelevant. Perhaps you would like to address that. It’s clear you cannot justify your claim about ALA, and yet again try to change the subject. Telco interconnets are happening everywhere, how do you think VM and C&W connect? ps. ICS pulled out of Selling. £50k gone. Interconnect between CPs is old hat. But it is very difficult for community networks to avoid BT in Market 1. It is also expensive for them because they cannot amortise their costs over a large pool of customers, which is precisely what BT Is trying to do with its standard model for BDUK procurements. What more can you tell us about ICS and Selling? What has this got to do with BT in Market 1? You have just brought up something else. Market 1 areas are Market 1s because Sky and TalkTalk have not unbundled. The allowed to call it fibre is because Virgin Media can call their service fibre, and in the same way you see lots of FTTx coverage from Europe, where they take journalists to the FTTP area, but ignore the areas with FTTC or B. Also what are TalkTalk and Sky calling their FTTC products? On business and leased lines – not ignored at all, they provide a totally different level of service, with uncontended bandwith and guarantees for fault repairs or penalties for not meeting them. Business parks often miss out currently because the economics don’t stack up, i.e. those cabinets have less lines on them. The same as a small cabinet in the middle of a housing estate may be missed. Remove all thoughts of fairness and think like an accountant and you have the roll-out mindset. The fact that the government investment has been so well signposted since 2008 means that Openreach can happily just go for areas with the best commercial opportunity. Talk to community projects about why they stop at a certain point, and lines like it will cost too much to go further come up, so really not that different, apart from we attach a ‘BT is evil’ label to anything they do, they need watching but they are not the spawn of the devil either. @Andrew – So, Virgin calling their patchwork quilt of coax cable networks “fibre”, and anyone else calling their FTTC implementation “fibre” is all fine, because everyone is doing it? Lemmings, please follow the big neon sign to the cliff – it’s just over there. Agreed, BT/Openreach are not the spawn of evil, however they are the incumbent with ownership of the final mile, and with that ownership comes a moral responsibility. A fine balance with shareholders to please. Don’t get me wrong – if I was BT/Openreach, I’d play the game just the same way, more or less. It’s those very economics, with CFOs defining rollout plans, that make community projects like B4RN feasible. That is, providing the communities can see through the misleading (back to “fibre” again) advertising by the incumbent operators flogging their non-fibre services.